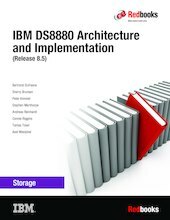 This IBM® Redbooks® publication describes the concepts, architecture, and implementation of the IBM DS8880 family. The book provides reference information to assist readers who need to plan for, install, and configure the DS8880 systems. The IBM DS8000® family is a high-performance, high-capacity, highly secure, and resilient series of disk storage systems. The DS8880 family is the latest and most advanced of the DS8000 offerings to date. The high availability, multiplatform support, including IBM Z, and simplified management tools help provide a cost-effective path to an on-demand and cloud-based infrastructures. The DS8884 and DS8886 are available as either hybrid models, or can be configured as all-flash. Each model represents the most recent in this series of high-performance, high-capacity, flexible, and resilient storage systems. These systems are intended to address the needs of the most demanding clients. Two powerful IBM POWER8® processor-based servers manage the cache to streamline disk I/O, maximizing performance and throughput. These capabilities are further enhanced with the availability of the second generation of high-performance flash enclosures (HPFEs Gen-2) and newer flash drives. Like its predecessors, the DS8880 supports advanced disaster recovery (DR) solutions, business continuity solutions, and thin provisioning. All disk drives in the DS8880 storage system include the Full Disk Encryption (FDE) feature. The DS8880 can automatically optimize the use of each storage tier, particularly flash drives, by using the IBM Easy Tier® feature. Release 8.5 introduces the Safeguarded Copy feature. The DS8882F Rack Mounted is decribed in a separate publication, Introducing the IBM DS8882F Rack Mounted Storage System, REDP-5505.